An imbalance in access to jobs created by the Harbour CBD located on the eastern edge of Greater Sydney – its concentration of 500,000 jobs is reinforced by its radial rail network and by the concentration of economic activity over the past 30 years with office precincts, universities and biotech clusters to the north and south along the Eastern Economic Corridor. The geography of the Sydney Basin including its waterways, ridges and the ring of national parks that frame the Basin, and limit the spatial extent of Greater Sydney. The ridges and ravines in particular, impede the development of roads and rail and in some areas significantly constrain accessibility. An historic car-based suburban form, which significantly influenced the pattern of growth in much of the western parts of Greater Sydney. Shifting demographics, with a greater proportion of older people in the central and western parts of the region, an increase in the number of children across the region, and a decline in the population of people of working age, leading to greater pressure for access to health and education services. Significant differences in the landscape, climate and amenity across the region – from the cooler eastern areas to the west which has many more hot days, low rainfall and less tree canopy cover. Also, advances in technology are increasingly changing how cities operate, from freight, retail, and personal transport choices to how information is disseminated, influencing how and where people work and how goods and services are accessed. Some manufacturing and distribution of goods are shifting to a smaller and medium scale, emphasising the role of local industrial and urban services land. 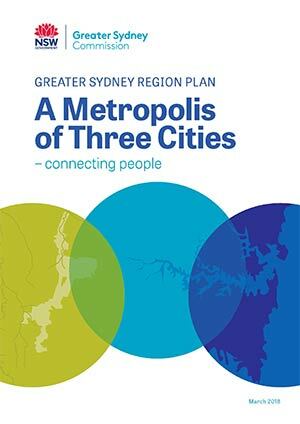 The Greater Sydney Region, in addition to being one of the fastest growing metropolises of the Western world, is a metropolis that is growing in three different ways, each of which presents its own challenges. In new communities – in land release areas – a large part of the growth is to come from a new urban corridor from Greater Macarthur in the south west, through Bringelly and Penrith in the west to Rouse Hill in the north west. At the same time, parts of existing urban areas are undergoing transformative urban renewal as they transition from suburban to walkable urban centres connected by high frequency public transport services with enhanced interchanges. Infill development is also playing an important role in delivering growth balanced with local character. The established Eastern Harbour City – building on its recognised economic strength and addressing liveability and sustainability. The developing Central River City – investing in a wide variety of infrastructure and services and improving amenity. The emerging Western Parkland City – establishing the framework for the development and success of an emerging new city.